Let’s make this clear, it’s entirely my own fault. A little while ago, I purchased our two young lads the soundtrack to the movie Frozen. This Cheergerm adores musicals, loves them in fact. (Repeat after me, life IS a musical.) However, after one solid week of hearing the song ‘Let It Go’ over and over again (whilst they play sword fights), I have one small sentence. 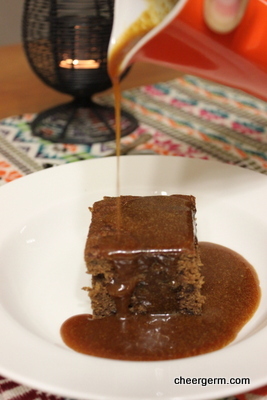 It was bloody freezing, so what better way to end a meal on a brass monkey kind of night, than with sticky date pudding? Cheergermed of course. This pudding was light and airy, and it must be said, one of my happiest and most raved about gluten free desserts thus far. Due to extreme pudding hunger (pudger?) I rushed the sauce and didn’t caramelise the sugar and water enough. Hence, when I added the cream and butter, it turned an insipid white creamy brown. Panic set in, (not helped by the glass or two of sparkling Shiraz that may or may not have been consumed.) The peanut gallery, aka Sister number 3 and Mancurian bro-in-law shouted in rough tavern-like voices, ‘add brown sugar’ and ‘add treacle!’ ‘Eureka’ I yelled, ‘I shall add organic molasses!’ So I whacked a tablespoon of that crazy, unctuous goo into the sauce. Disaster averted. It was good and they ate. Preheat oven to 180C (160C fan forced.) Grease and line the base of a 20cm square cake pan. Combine the dates and bicarbonate of soda in a medium bowl and pour the boiling water over. Set aside whilst preparing the cake batter. 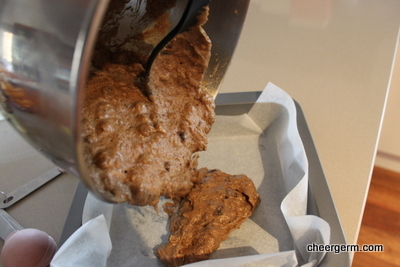 Sift the sorghum flour, buckwheat flour, almond meal, vanilla powder and xanthum gum into a large bowl. 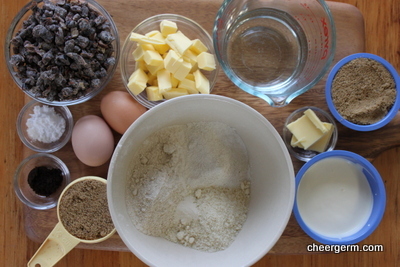 Fold the flour mixture into the butter mixture then stir through the date mixture until smooth. Pour into the cake pan and bake for 30 minutes or until golden and cooked through. Stand in pan for 5 minutes then remove to a rack. 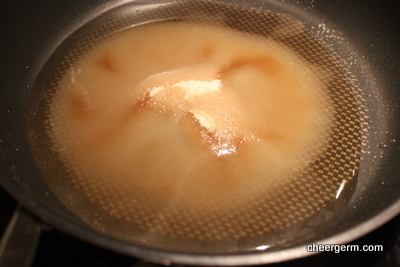 Place sugar and water in frying pan. Swirl until sugar has melted. 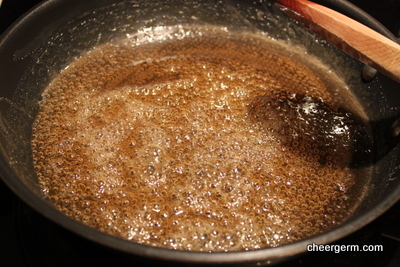 Bring to a boil and cook until the mixture is a deep, golden caramel colour, about 4-5 minutes. Remove from heat and whisk in the cream and butter, whisking until smooth. 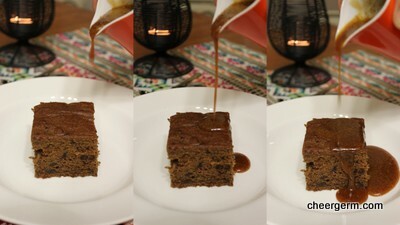 Slice cake into squares and drizzle over sauce. Serve with cream or ice-cream if you so desire. A Cheergerm Adapatation of a recipe from the Coles website, see after photos for the link. 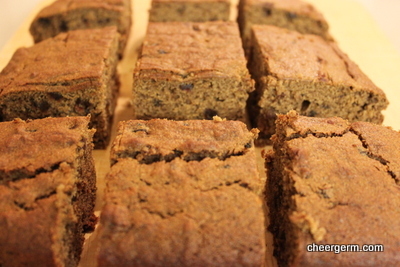 This entry was posted in Gluten free baking and desserts and tagged almond meal, baking, buckwheat flour, cheergerm, Cooking, dates, gluten free, gluten free sticky date pudding, recipes, sorghum flour, sticky date pudding. Bookmark the permalink. 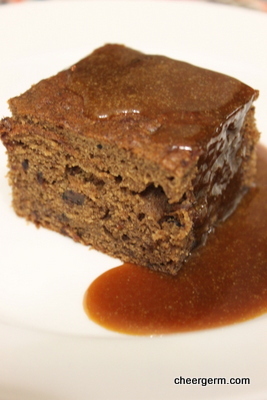 Sticky date pudding is just about my favourite deep winter dessert ever. This version looks absolutely beautiful. And I have a very sad confession, that one song from Frozen is my 2014 guilty pleasure. I read many newspapers with a furrowed brow afterwards to make up for it though. Ooooh. I have drooled over Le Creuset for years but confined myself to a Target enameled Dutch oven for a fraction of the price. It is now chipped… as for cast iron, I would be terrified lest it get rusty. I have only recently discovered a good method for keeping my grill pan seasoned, since I don’t constantly use it. I was a lucky chick and was given one as a going away gift when I was leaving my educational publishing career to re-educate myself in the hands on foodie world. 17 years ago now and it’s bloody brilliant! It’s never rusted and is virtually stain resistant as long as I treat it right. I just googled to see if I could find one similar but I couldn’t, maybe they no longer make them? I do hanker after an enamelled version but have not, thus far, made that investment….which brings me full circle to my bloody slow cooker…..ha! 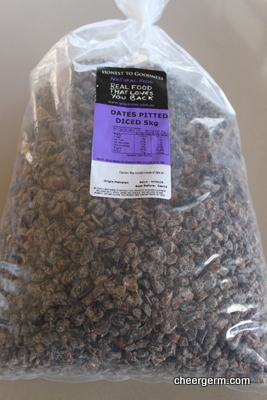 I buy my dates in bulk from Costco, but your 5kg bag is a winner! I love sticky date pudding too. With extra butterscotch of course! I truly cannot envision a better night than eating Osso Buco, sparkling Shiraz and Sticky Toffee Pud while watching Frozen with a team of gregarious, slightly tipsy bar room folk who all want to sing along. Perfect, perfect night. As long as someone else does the dishes at the end of it while I fall asleep on the couch. It’s a great movie and soundtrack, yes, it’s the repeat that does it. The same thing happened to the Les Miserables soundtrack, the Look Down song from the start must have been played 2 million times in a row by Kid 2!!! Crikey…. I would very much like to make this but i am not sure how much butter or of the various flours as I measure it in cups/tablespoons. And I have no idea what the oven temperature should be; we use degrees. Can you translate measurement for USA baking?